February 5, 2019 – Scattered showers this morning southeast of Chico with low snow levels down the the foothills and northern Sacramento valley floor. Drier weather expected by mid-week before precipitation chances return Thursday night and Friday. Current Satellite imagery shows cold upper low center now over Northwest California. Scattered showers showing up on Radar east of the Sacramento valley and south of about Sacramento. northwest of the low center under northerly upper flow showing relatively little shower activity. 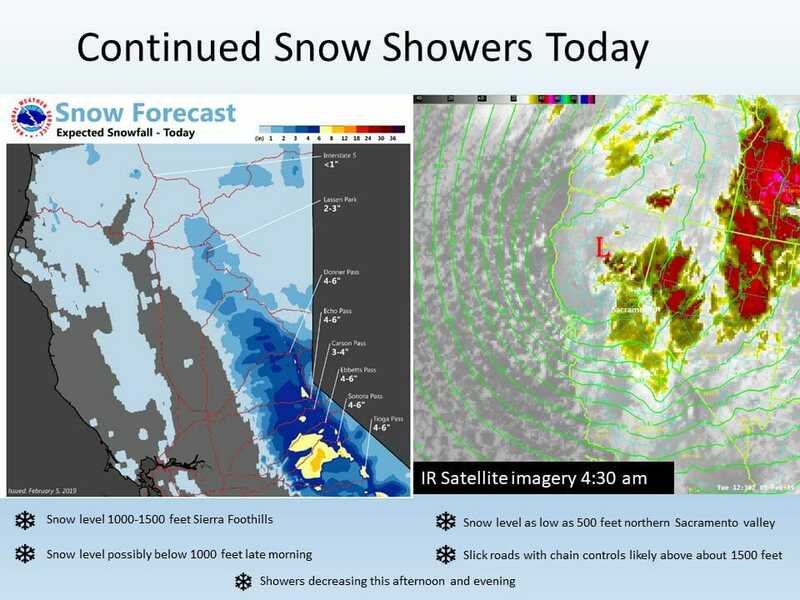 Expect continued little in the way of shower activity west of the low center this morning and have therefore cancelled the remainder of the winter storm warning over the coast range and Shasta county. 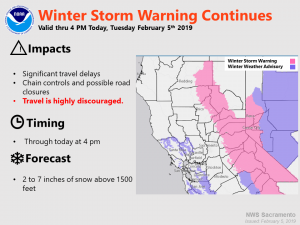 Scattered snow showers over the Sierra Cascade range and foothills will keep winter weather issues going there through at least the morning hours so winter storm warning will remain there. Cold air associated with the low will continue to bring down snow levels. Snow levels over the foothills this morning between about 1000 and 2000 feet but will continue to fall possibly dropping to below 1000 feet later this morning. This will bring snowfall down to areas where snow is relatively rare. Snow may also be possible in the northern Sacramento valley in the Redding area this morning but slightly above freezing temperatures and low precipitation amounts should keep impacts to this area to a minimum. Temperatures in the valley this morning are about 10 degrees colder than 24 hours ago and minimum temperatures in the 30s will be common. 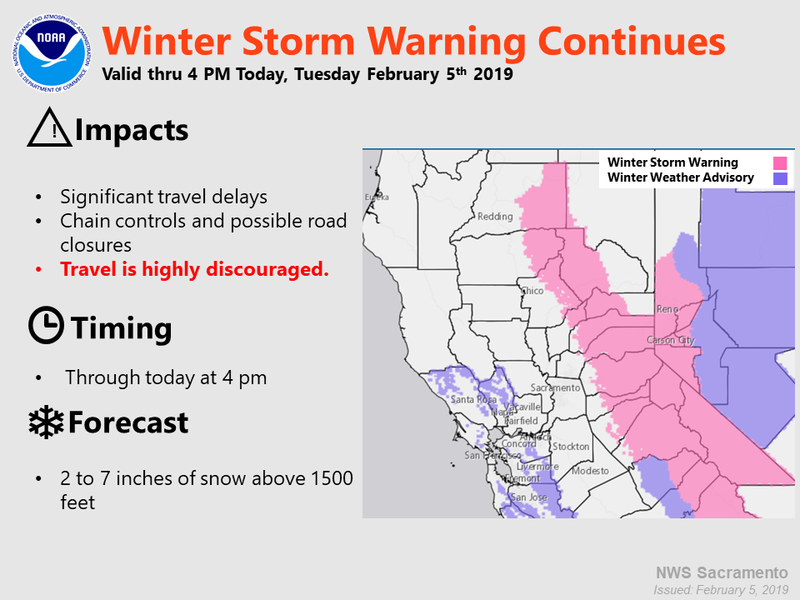 The upper low is forecast to shift into the Great Basin by early this evening and this should bring a significant drop off in precipitation over the Sierra Cascade range. Can not rule out a few light showers over the Sierra Cascade range Wednesday morning but northerly flow aloft Wednesday afternoon should end any precipitation threat and bring clearing. Daytime highs Wednesday will remain below normal in the cold airmass despite mainly fair skies in the afternoon. Wednesday night and Thursday look dry under brief high pressure ridging while more stable conditions allow for a little morning valley fog. Overall high temperatures Thursday are expected to climb only slightly. By Thursday evening, upper ridge axis is forecast to shift east of the forecast area as the next Pacific Frontal system approaches the coast. By Friday morning, the northern half of the forecast area could see some light precipitation ahead of this front. Most of the forecast area will see a threat of precipitation Friday and Friday night but with much of the energy from this system expected to move south of the forecast area, precipitation amounts should remain light. Short wave trough progged to move through Interior NorCal early Saturday followed by a deeper and colder low which digs down the West Coast and swings inland Sunday. This will keep wet weather through the weekend with rain in the Central Valley and snow in the foothills and mountains. EC is more progressive with this storm and ends precip Sunday night while GFS keeps showers going into Monday. Confidence in forecast diminishes early next week as models diverge even more. GFS drops another colder low from the north into the CWA Tuesday while EC brings some lower latitude overrunning precip late Tuesday. Given current pattern, forecast leans more towards GFS solution.